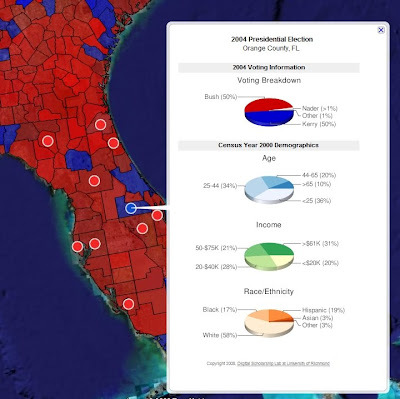 , the Google Earth team has mapped historical election results in Google Earth and Google Maps. These maps show how the population has voted in past presidential elections from 1980 through 2004, and include election results at both the state and county levels. The maps also include demographic information derived from the 1980, 1990, and 2000 US Census. Download this KML to Google Earth. You can also animate the election results over time. 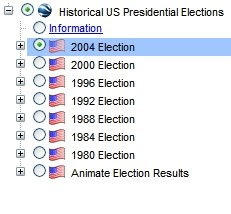 Check on "Animate US Presidential Election Results", the last item in the KML folder. 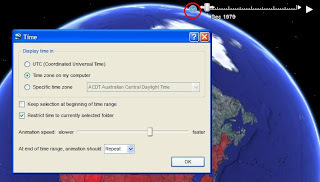 Click on the clock icon on the left hand side of the time slider to open up the "Time" option window; adjust the Animation speed to be faster. Click OK.
Hit the play button on the right and watch how voting patterns have changed over time from 1980 -2004! We also developed an embeddable Google Map, which can be viewed at this page. If you like the map, you can also add it to your website by clicking on the "Embed This Map" button and customize how it looks on your site. 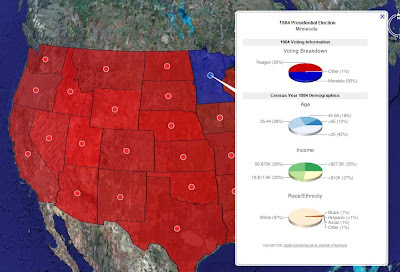 Here are some of the interesting things we found by exploring these historical voting maps. Florida was a key state in 2004 presidential election between George W. Bush and John Kerry. You can check how each county voted in 2004 and then try to make your own projections of which way they will go this time. If you want to see more US election related news and maps, visit the Google Election page and Google Election 08 Map Gallery. There are more fun maps to browse, news to read, and useful tools to help you to stay informed. In the final days of this captivating presidential election season, are you interested in knowing how US has voted in the past? Together with the Digital Scholarship Lab at University of Richmond, the Google Earth team has mapped historical election results in Google Earth and Google Maps. These maps show how the population has voted in past presidential elections from 1980 through 2004, and include election results at both the state and county levels. The maps also include demographic information derived from the 1980, 1990, and 2000 US Census.